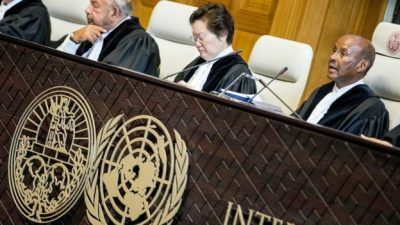 Iran opened a lawsuit on Monday demanding the UN’s top court, the International Court of Justice (ICJ), order the suspension of renewed US sanctions which it says are devastating its economy. The Islamic Republic says US President Donald Trump‘s decision to reimpose sanctions over its nuclear programme aims to bring it “to its knees” and is in breach of a 1955 friendship treaty. Sanctions had been lifted under a 2015 multilateral agreement in return for Iran committing not to pursue nuclear weapons. In May, Trump announced that the US would abandon the deal. Then last month, his administration reimposed unilateral sanctions, saying they were needed to ensure Iran never builds a nuclear bomb. A second wave of sanctions are due to hit Iran in early November, targeting its banking and energy sectors, including oil exports. The measures have added to Iran’s economic woes, helping to fuel strikes and protests across the country and political spectrum. Since April, the rial has lost half of its value and a government strategy to keep the currency from sliding even further backfired. On Sunday, Iran’s parliament impeached Masoud Karbasian, the finance minister. As the suit began, the head of the navy of Iran’s Revolutionary Guard reportedly said that the country had full control of the Gulf and the Strait of Hormuz, according to Tasnim news agency. Iranian officials have repeatedly threatened to block the strait, a major oil shipping route, in retaliation for any hostile US action. Iran’s Supreme Leader Ayatollah Ali Khamenei said in July that if Iran is not permitted to export oil, no other country in the region should be allowed to. As the suit opened on Monday, the presiding judge of the UN body – informally known as the World Court – began the hearing by calling on Washington to respect its outcome. During their decades of animosity, both the United States and Iran have ignored some rulings at the court. He said Iran had sought a diplomatic solution to the countries’ dispute but was rejected. The United States said in an initial written reaction displayed in court that it believes the ICJ has no jurisdiction in the case, and that Iran’s assertions fall outside the bounds of the treaty. US lawyers led by State Department adviser Jennifer Newstead, appointed by Trump in 2017, are due to respond on Tuesday. A ruling is expected within a month, though no date has been set. Tehran filed its case before the court in late July, calling on the Hague-based tribunal’s judges to order the immediate lifting of sanctions pending a definitive ruling. It said the sanctions would cause it “irreparable prejudice”. “The current US administration is pushing the sanctions to their maximum with the sole aim of bringing Iran to its knees,” Iran’s lawyers said in the court filing. The lawyers have also said in their filings that the sanctions threaten tens of billions of dollars’ worth of business deals with foreign companies. International companies including France’s Total, Peugeot and Renault, and Germany’s Siemens and Daimler, have suspended operations in Iran since Trump announced the US withdrawal from the nuclear deal in May. Air France and British Airways announced on Thursday that they would halt flights to Tehran next month, saying they were not commercially viable. The British carrier added however that the decision was unrelated to the fresh sanctions. Trump said the sanctions would turn up the financial pressure on Tehran to come to a “comprehensive and lasting solution” regarding its activities such as its “ballistic missile programme and its support for terrorism”. Khamenei this month appeared to rule out any immediate prospect of talks, saying “there will be neither war, nor negotiations”, with the US. The ICJ was set up in 1946 to rule in disputes between countries.